Back In Montréal / New Zines In Stock! After a few weeks of carrying around a backpack full of zines, tabling at the Chicago Zine Fest, spending a week with my bestie in Columbus, Ohio and taking more buses than I can count, I am finally home sweet home. I don’t have time to write about my adventures right now, but I do have time to tell you about a whole bunch of new zines that are in stock. I’ve listed them below. Just click How To Order for more info (sad to say that postage rates went up by a couple of bucks today, which is why I had my end-of-the-winter sale before my travels). Every order comes with a free copy of the second issue of the Fight Boredom Distro Newsletter – finished just a couple of weeks ago. It’s got a letter to my readers, info on new zines in stock, calls for submissions, a collaboration of writing prompts by Maranda Elizabeth and I, and more. Working on the newsletter – all of the purple makes it pretty obvious that I’m workin’ at Maranda’s desk. Any zine with a picture of Godspeed You! Black Emperor on the first (okay, third) page is bound to win me over (it is also bound with staples SEE WHAT I DID THERE). But whether or not that means anything to you, this zine is both beautiful (half-legal pages with a screenprinted cover and crisp photographs throughout) and an excellent read. Aaron writes about continuing to feel hopeful in the face of despair – a specific kind of despair, the kind that comes from resisting capitalism, witnessing / experiencing police brutality, and working toward a more just world. We begin in the aftermath of the G20 in Toronto, and follow Aaron through his tales of hope – a friend successfully fighting deportation, resistance of Israeli occupation forces in Palestine, and the student strike in Québec in 2012. For those into personal writing on political struggles. Okay, this zine is so great! 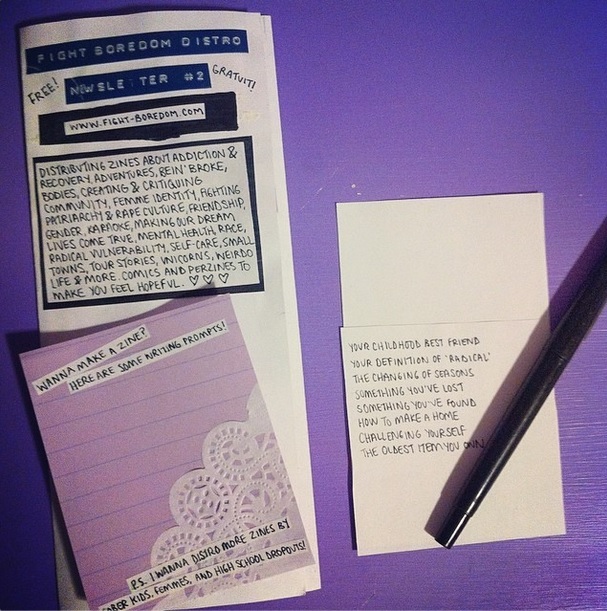 Khristina did the Fight Boredom Zine Residency in 2012 and wrote What To Keep, What To Give Away, and this is her followup zine, which pretty much picks up where the first left off. In the intro, she says that this zine is about her two-week residency (writing, “I found sustenance (both the soul-filling kind and the literal kind) in dinner parties, quiet hang-outs, and bike rides.”), her little sister, thinking about identity, and healing family trauma. There is quite a bit covered in this zine, from finding inspiration and complication in Loretta Ross and bell hooks, to intersecting identities of woman of colour and punk, to falling in love, and more. Intense and brutally honest. Sometimes people approach my table at zinefests and ask, “Do you have any cheerful zines?” and I always hand them a copy of Dig Deep. Some running themes are friendship, growing up and creating a meaningful life, and maintaining a positive mental attitude. Out on time for the fifth annual Chicago Zine Fest, this is the sixth issue of Dig Deep – written over the course of the winter and documenting the past year of Heather’s life. She writes about the manifold ways that attending (and becoming a co-organizer for) the Chicago Zine Fest has changed her life, the eternal struggle to balance creative pursuits and social activities and alone time, a response to Inspirado (a zine about art and inspiration), a personally satisfying reaction to street harassment, and the discovery of a 66-page typewritten family history by her grandmother. It’s been fifteen years since Heather made her first zine, and she has got it down. “Me and Elliott had a lot in common – a kind of potentially delusional hope – serious drive to do something. Neither of us drank too much back then. We looked a lot alike. We both liked to flee. He called it regroup, get away, get some perspective.” The bulk of this zine is the story of Cindy and Elliott – the beginning of their friendship, traveling and squatting together, learning about each other’s favourite authors. Like Dig Deep (just added above), some running themes in this zine are friendship and growing up. Also included is a piece called Reparations, about acknowledging white privilege and taking steps to indeed make reparations, which for the author includes not just educating herself, but also doing things like giving a percentage of her income to organizations run by people of colour. And on the note of growing up, Cindy also writes about becoming vegetarian at fifteen years old, and how her food politics have grown and changed – influenced partly by the fact that her sister has Crohn’s Disease and can only digest protein from meat and eggs. So they are raising sheep for food on their farm, and Cindy writes thoughtfully not only about food politics, but about the lessons she is subsequently learning about love and loss. And of course, there are the little things: drawings and book recommendations and questions for you to think about. This is a zine about the horrendously frustrating process of applying for welfare and disability in British Columbia, Canada. It’s a personal story of mental illness and class, stigma and shame. Terri writes about the never-ending paperwork, phone calls, and walks to the welfare office, as well as unlearning the shame that comes with the inability to work a “real” job, and accepting money from family, which of course is not an option for everyone. It’s laid-out beautifully and written simply and honestly. You might already know Alanna from Finale 95 and Puker Nation, well here is another rad zine from her weirdo mind. It’s all about working in an ice cream parlour! I love reading customer service stories anyway (hey, I’ve worked in convenience stores, call centres, and coffee shops, so I’m full of ’em), and this one is basically a comic full of hilarious stories from work – like, the kinda messages that people have iced onto their cakes, quirky customer profiles, and a classic battle over which radio station will be played at work. Super fun times! Coming Soon: Pansy #9; Motor City Kitty #23; Abstract Door #1-#3; Tongueswell #2; Always & Forever: A Zine About Friendship; Finale 95 #3; Cheaptoys #14 and more.